Let's start with the basic definition of radiation. Radiation is the process in which energy is emitted as particles or waves. Common examples of radiation are the music we listen to as well as the electromagnetic properties used to run our mobile phones. In the field of radiation therapy, we consider how energy emitted; which is, radiation can be used in the treatment of cancer. Although we may not think about it, radiation is and has always been all around us. 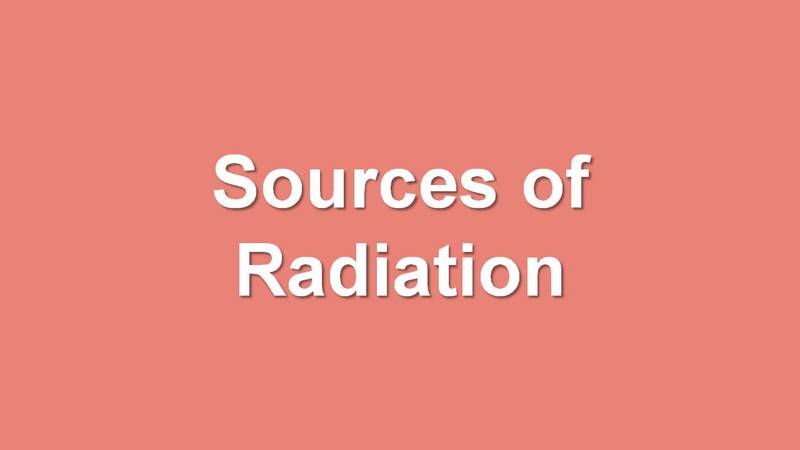 Sources of radiation come from natural as well as man-made sources. There are three principal areas which make up natural sources of radiation. The first area of these natural sources is radon. You cannot see or feel radon. Radon gas comes from the ground and is the product of the decay of radioactive material. Radon is a major factor in the cause of lung cancer. A second area of natural sources of radiation is cosmic or space radiation. One every day example of the cosmic radiation we receive is sunshine. Indeed, we are constantly bombarded by radiation from space, similar to a steady drizzle of rain. Charged particles from the sun and stars interact with the earth’s atmosphere and magnetic field to produce a shower of radiation that we are all exposed. A third area of natural sources of radiation is called terrestrial radiation. When we use the word terrestrial we mean natural sources of radiation “other than radon”. 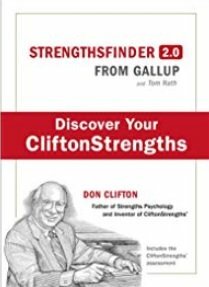 These sources may be internal sources; which means, they are actually present in our bodies. Radiation is present in our bodies coming from the foods we eat as well as the world we live in. For example, the bananas we eat have potassium and some of this potassium is radioactive. Cigarette smoke is also a source of internal radiation. In addition to internal sources, radiation is everywhere in our environment. 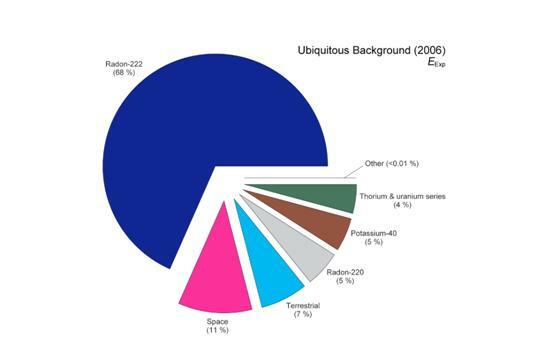 Please see the image below which is a pie chart of natural radiation sources. Radiation also comes from man-made sources. About half of the man-made sources come from medical radiation exposure. Some examples of medical radiation exposure include: CT scan, x-rays, as well as nuclear medicine studies. In the United States, radiation emitting products are controlled by the US Food and Drug Administration. Of course, in our field of radiation therapy we are also concerned with occupational exposure. There are many other sources of man-made radiation. These other sources include smoke detectors, luggage security screening, radiation-treated materials like food as well as the mail, and industrial instrumentation. Learn more about other sources of man-made radiation at the US Environmental Protection Agency educational website called RadTown.